The Division Annual Business Meeting will take place first with short presentation of Officer and Director Reports, proposed changes to the Constitution, and election of Division Officers and Directors. The popular ‘Works-in-Progress’ program will be featured from 9 a.m. to 12 p.m. followed by a break and a self-guided afternoon tour of five outstanding area layouts. The ‘WIPS’ format has proved very popular and features multiple, simultaneous, mini-group clinics in which a clinician can intimately detail their work on a given project and engage in casual conversation with 6-8 attendees for 20-30 minutes before the groups rotate to another “WIP”. The GSD is currently evaluating many potential WIPS including, but not limited to, weathering techniques with PanPastels, building Fast-Tracks turnouts, unique techniques with Super Trees, molds and resin castings and railfan photography. and ONE great club layout to visit. 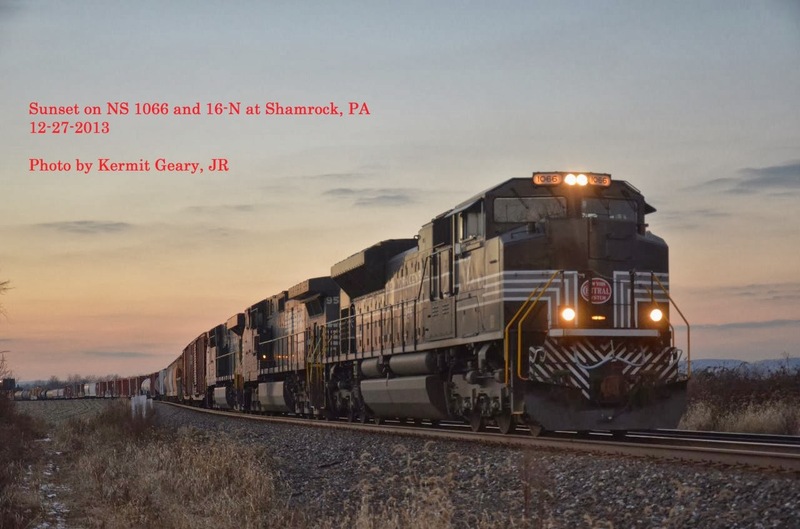 1:00 p.m. to 5:00 5:00 p.m.
Jeff Taylor’s Rockaway Southern Railroad is a short line providing North-South bridge and local freight service between South Plainfield and Dover, NJ. Interchange and track rights are provided with the CNJ, Lehigh Valley and Erie-Lackawanna around 1964. Meet Coordinator Jim Fawcett will be unveiling his B&O “Old Main Line ” as a true work-in-progress with a display of outstanding benchwork, creative lighting and thoughtful backdrop design that he has completed prior to trackwork. Andy Rubbo’s New York Division of the PRR was featured in Great Model Railroads 2013. It features astounding detail including hand-fabricated overhead catenary and stunning urban scenery. The Lehigh Valley Harbor Terminal Railway by Ralph Heiss models the Lehigh Valley in and around the New York waterfront around 1951. 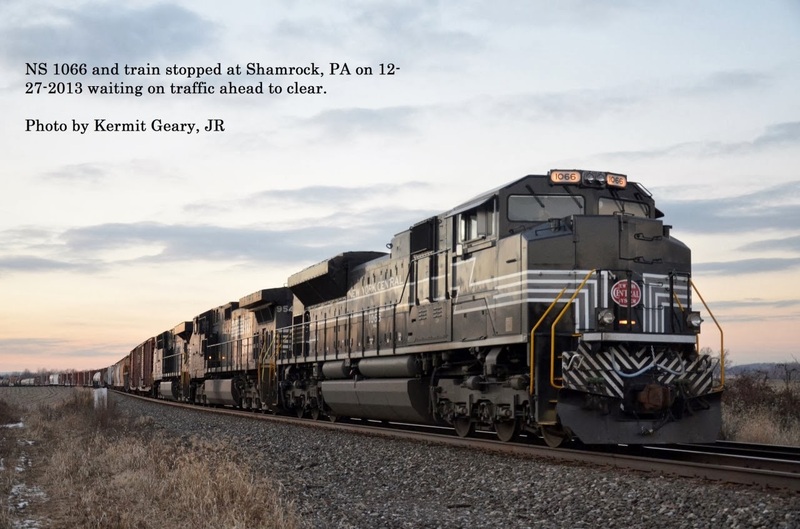 The intricate switching challenges brought operators throughout the nation to South Plainfield this past April as part of the renowned Pro-Rail event. The massive, but still-expanding layout of The Model Railroad Club. Enjoy an up close and personnel look at this great layout from area usually closed off during the public exhibitions. We will have a “White Elephant” table. There are always bargains here! JACKSONVILLE, Fla. - January 30, 2014 - CSX Corporation (NYSE: CSX) today announced that the company achieved a position on the CDP Supplier Climate Performance Leadership Index (SCPLI) for environmental stewardship in 2013. CSX was recognized for its steadfast commitment to helping its customers make informed transportation decisions that reduce carbon emissions and meet their sustainability goals. "At CSX, we take seriously our responsibility to help customers understand their carbon footprint and capitalize on the environmental benefits of freight rail to reduce transportation-related emissions while improving efficiency," said Michael Ward, chief executive officer of CSX. "We are honored to be included on the CDP Supplier Climate Performance Leadership Index and continue to look for new ways to partner with customers to implement environmentally sustainable technologies and practices." The CDP index, compiled by FirstCarbon Solutions (FCS), serves as an evaluation tool for supply chain members and participating suppliers, highlighting top companies' best practices for reducing their carbon footprints and optimizing performance. In its pilot year, the index is recognizing 80 companies based on analysis from more than 2,800 responses to CDP's 2013 supply chain questionnaire. In 2013, CSX was recognized on the CDP S&P 500 Carbon Performance Leadership Index (CPLI) for its emissions reductions and fuel use, and was the only railroad among five industrial companies to earn a spot on the CDP Climate Performance Leadership Index. CSX was also in the top 10 of 40 industrial companies on the 2013 Global Climate Performance Leadership Index, which evaluates the sustainability efforts of the world's 500 largest companies. 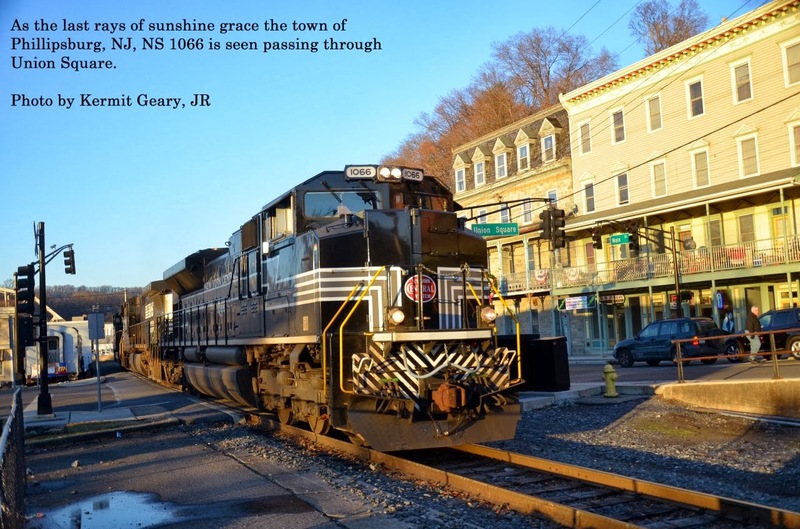 A early Saturday morning internet posting made me aware NS's heritage unit NKP 8100 would be leading 22V after working Bethlehem. Despite the dreariness of the morning, I decided to head out to Bloomsbury (LEHL MP 68-NJ) and arrived a few minutes before 22V would pass by my location. Those yellow stripes on its nose certainly helped to make it stand out on this overcast day. NS's "all day" 11J, so-called since it is a low priority train, would be holding on the siding @ MP 67 for 22V to pass. After 22V had passed and realizing the weather wasn't going to get any better, I decided to head home past Flemington Jct (LEHL MP 51) to see if there were any trains waiting on the siding. Sure enough 22V was being held for 21M. That would give me sufficient time to head down to Three Bridges (LEHL MP 48) for still one more image of NKP 8100. With that image in my record book, that leaves fifteen more left to photograph! Received the following via email on 1-28-14. Due to extreme weather conditions shipments moving across the Midwest and Northeast may see delays of 24 to 48 hours. In addition, Winter Storm Leon may affect areas across the southern region due to anticipated snow and ice conditions. In locations where these extreme temperatures are combined with snow or ice conditions, some local service may be curtailed. Operations and Service Support are working with customers to coordinate local operations that may be affected. Saturday's move of an Air Products high/wide load down the Lehigh Line seemed to move without a hitch. Its arrival in Manville (NJ) around 3 PM was close to the time previous shipments have arrived there for the overnight stay. NS's power consisted of NS 6783 (EMD SD60M, ex-CR 5533) and NS 2622 (EMD SD70M). 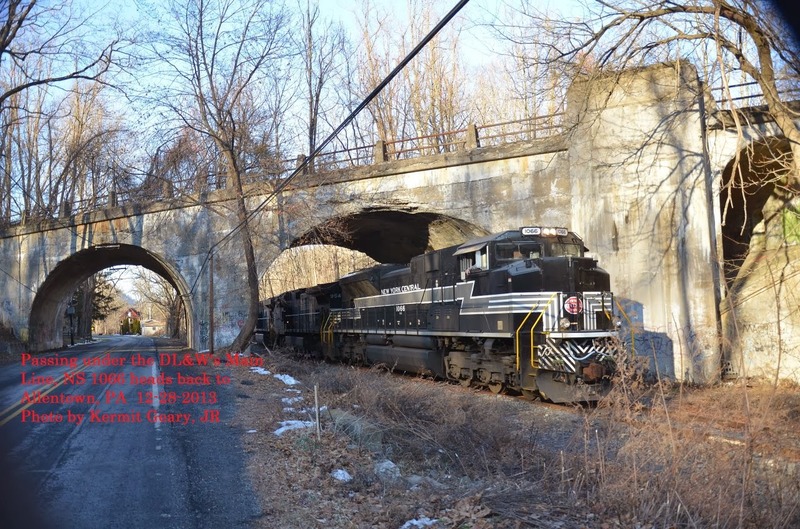 The first image shows it approaching the Valley Road grade crossing (LEHL MP 40) in Hillsborough (NJ). 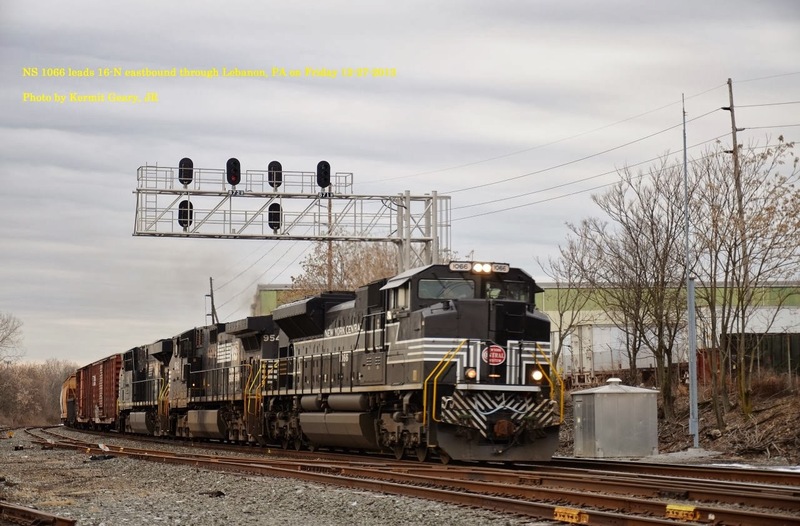 That second image finds it backing in Manville yard to await the second leg of its journey on Sunday morning down CSX's Trenton Line. No idea as to where the high/wide's eventual destination will be but it is destined to be shipped overseas. Working from home does have its advantages! With nine inches of snow having fallen the previous day, there was no way I would be making the drive into the office. Instead I opted to work from home. After staring at my laptop's monitor for a better part of the day, my eyeballs needed an afternoon break. 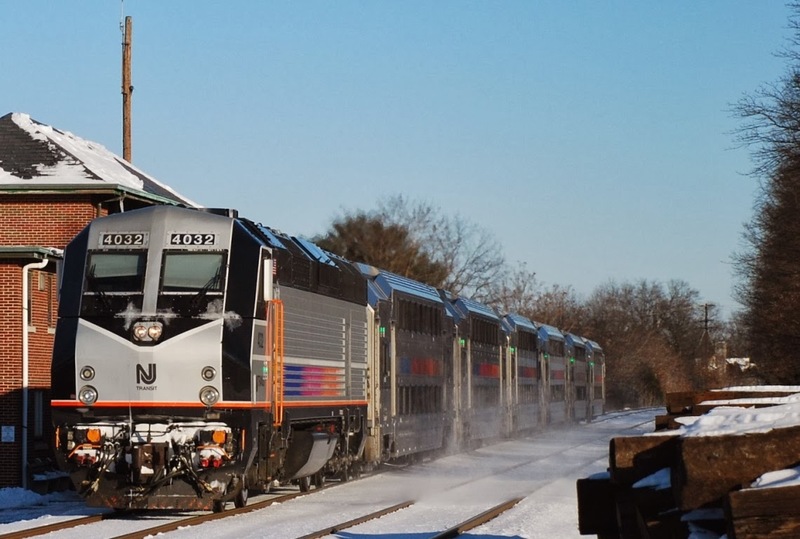 By late afternoon the roads were cleaned and Wednesday's sunshine was something that shouldn't go to waste.What better way to give them that break than heading down to NJ Transit's Raritan Valley Line and seeing what was running. NJT was operating a "enhanced weekend schedule" due to the snow storm which meant no service to High Bridge. All trains would terminate in Raritan. Bundling up to stay warm when it is seventeen degrees, I decided to head down to Raritan to get one quick photo of NJT's train 5525 arriving. It is seen passing by what once was the CNJ RA interlocking tower that is now used by NJT. After that train passed, it was back home now that my impromptu break had ended. There you will find lists of clinics and vendors, complete timetable, hotel information, and a registration form. 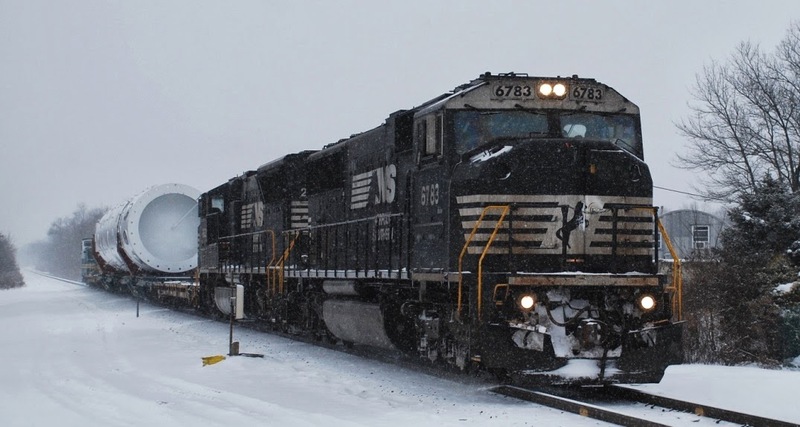 NORFOLK, VA. – Norfolk Southern Corporation announced that its Board of Directors today voted to increase the regular quarterly dividend on the company’s common stock by 4 percent, or 2 cents per share, from 52 to 54 cents per share. The increased dividend is payable on March 10 to stockholders of record on Feb. 7. Since its inception in 1982, Norfolk Southern has paid dividends on its common stock for 126 consecutive quarters. NORFOLK, VA. – Norfolk Southern reported record fourth-quarter 2013 net income of $513 million, or $1.64 per diluted share, 24 percent higher compared with $413 million, or $1.30 per diluted share, earned in the fourth quarter of 2012. The railway operating ratio, or operating expenses as a percentage of revenue, improved 5 percent to 69.4 percent. § Railway operating revenues totaled $2.9 billion, up 7 percent. § Income from railway operations was $881 million, 23 percent higher. § Net income totaled $513 million, up 24 percent. § Diluted earnings per share of $1.64 improved 26 percent. § Railway operating revenues reached $11.2 billion, up 2 percent. § Income from railway operations was $3.3 billion, 4 percent higher. § Net income totaled $1.9 billion, up 9 percent. § Diluted earnings per share of $6.04 improved 12 percent. § The railway operating ratio improved 1 percent to 71.0 percent. 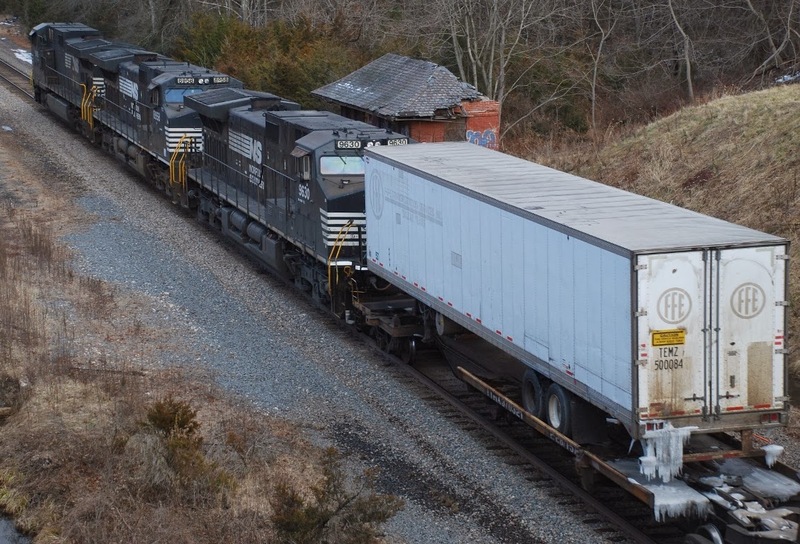 “Norfolk Southern’s team of safety and service-oriented employees drove our record-setting fourth-quarter results through increased productivity, efficient network operations, and continued revenue gains,” said Norfolk Southern CEO Wick Moorman. ”We’re seeing the results of our investments in network capacity and technology enhance our ability to offer superior service to all of our customers. Operating revenues increased to $2.9 billion, marking a 7 percent jump compared with fourth-quarter 2012. Strong intermodal, chemical, automotive, and agricultural shipments more than offset declines in coal traffic to drive total volumes up 4 percent. § Chemicals up 21 percent. § Metals and construction up 12 percent. § Intermodal up 6 percent. § Agriculture up 9 percent. § Automotive up 10 percent. § Paper and forest products up 8 percent. § Coal down 2 percent. General merchandise revenues were $1.6 billion, 12 percent higher than the same period last year. Strong crude by rail shipments and expanded automotive production helped boost traffic volume by 8 percent in the quarter. Coal revenues were $641 million, 2 percent lower compared with the fourth quarter of 2012, the result of an 8 percent decline in volumes. Intermodal revenues increased to $618 million, a 6 percent increase over 2012. Growth in domestic and international business pushed traffic volume up 6 percent in the quarter compared with the same period of 2012. Railway operating expenses were $2 billion, 2 percent higher than in the same period of 2012. The operating ratio was 69.4 percent, a 5 percent improvement over the same quarter in 2012. Income from railway operations was $881 million, 23 percent higher compared with fourth-quarter 2012. · Net income was $1.9 billion, or $6.04 per diluted share, 9 percent higher compared with $1.7 billion or $5.37 per diluted share in 2012. · Railway operating revenues reached $11.2 million, 2 percent higher compared with 2012, driven by a 3 percent increase in traffic volume. · General merchandise revenues rose 7 percent, and traffic volume increased by 4 percent. · Coal revenues declined 12 percent to $2.5 billion, due to a 5 percent decline in traffic volume compared with the same period of 2012. 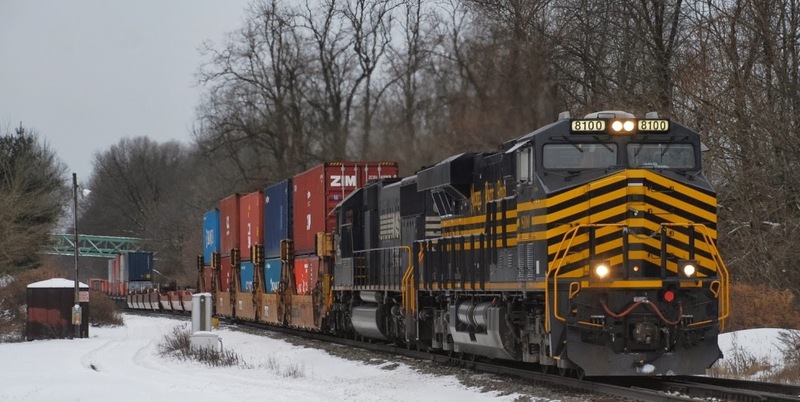 · Intermodal revenues increased to $2.4 billion, up 6 percent compared with 2012. Growth in domestic and international intermodal business drove traffic volume 6 percent higher for 2013 compared with the same period of 2012. · Railway operating expenses were $8 billion, up 1 percent compared with 2012. · The operating ratio for the year was 71.0 percent, a 1 percent improvement over 2012. · Income from railway operations was $3.3 billion for 2013, 4 percent higher compared with 2012. NORFOLK, VA – Amy E. Miles and James A. Squires have been elected directors of Norfolk Southern Corporation (NYSE: NSC) effective today, Chairman and CEO Wick Moorman announced. Miles, 47, of Knoxville, has served as chief executive officer and a director of the largest movie theater company in the U.S., Regal Entertainment Group Inc. (NYSE: RGC), since 2009. Before that, she served as executive vice president, chief financial officer, and treasurer. Miles joined Regal Cinemas Inc. as senior vice president finance in 1999, after working with Deloitte & Touche and PricewaterhouseCoopers LLC. Miles is a director of National CineMedia Inc., the Regal Foundation, and Variety of Eastern Tennessee. She is an executive board member of the National Association of Theater Owners. Miles has been appointed to the audit and finance committees of the Norfolk Southern board. Squires, 52, was named Norfolk Southern president in 2013, responsible for the corporation’s administration, finance, law and corporate relations, and planning and information technology divisions. Prior to that, he served as Norfolk Southern’s executive vice president administration, executive vice president finance and chief financial officer, senior vice president law, vice president law, and in various law department staff positions beginning in 1992. Squires serves on the board of the U.S. Chamber of Commerce and has served as a trustee of the Sentara Healthcare System. He was chairman of the Virginia Transportation Accountability Commission that reported to the governor and General Assembly on measuring and improving the performance of the Commonwealth’s transportation systems and agencies. Week two of scheduled MOW shutdowns on SEPTA's Norristown Line has NS 24K (Rutherford to Morrisville, PA) re-routed once again over NS’s Lehigh Line and then down CSX’s Trenton Line (TL). Upon its arrival at Port Reading Jct in Manville, 24K reversed its direction to head west over the TL as CSX B100-18. After holding for CSX K533 to clear, B100-18 is seen here heading west at MP50 on the TL at Belle Mead (NJ) on January 18, 2014 at 2:10 pm. 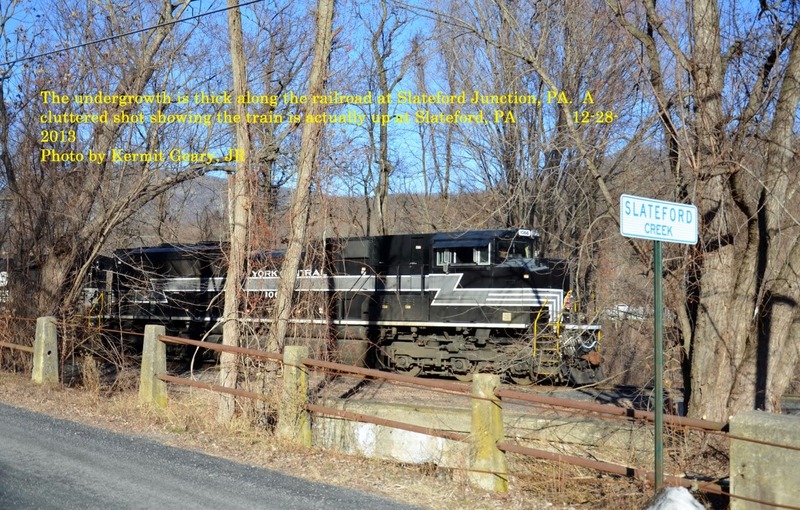 Operating in a push / pull mode, NS motive power for the run down the Lehigh Line (LEHL) was NS 9630, NS 8958 and NS 9496. NS 9377 and NS 9392 would be the TL power consist. The icicles seen hanging off of the TOFC in the second image is most likely from condensation or top-icing draining and freezing. JACKSONVILLE, Fla. - January 20, 2014 - CSX Corporation (NYSE: CSX) today announced the appointment of Bryan Rhode as regional vice president - state government affairs in Virginia. Reporting to Quintin Kendall, vice president - state government and community affairs, Rhode is responsible for CSX Transportation's executive branch, legislative and community initiatives in Virginia, and oversees similar efforts in Maryland and Delaware. "Bryan's extensive background in public safety is an ideal complement to CSX's commitment to running an industry-leading safe, reliable railroad, and we are pleased to welcome him to the CSX team," Kendall said. Prior to joining CSX, Rhode served as Virginia secretary of public safety, where he provided oversight for 11 state agencies and advised the governor on public safety policy issues. Rhode also previously served as deputy secretary of public safety and as commissioner of the Department of Alcoholic Beverage Control. Rhode is a graduate of the Pennsylvania State University, the University of Virginia School of Law and the London School of Economics. Following his military service as a captain in the United States Marine Corps, Rhode worked as an associate corporate attorney and served as an Assistant Commonwealth's Attorney in Richmond. With SEPTA performing track work starting January 11, 2014, trains in and out of the Morrisville (PA) facility will face some delays. NS 24K (Rutherford to Morrisville) was re-routed over the LEHL and down the Trenton Line (TL). It is seen here heading west over the TL at Manville (NJ) on Sunday. NS motive power for the run down the Lehigh Line (LEHL) was NS 9849, NS 2618 and NS 7625. Upon its arrival at Port Reading Jct, NS 8373 and NS 8128 was the power consist. Photo 1: Manville's Bridge Street Bridge is seen in the background as 24K, CSX symbol X999-12, starts its trip down the TL. Photo 2: NS 7625, NS 2618 and NS 9849 bring up the rear markers as it travels west past MP 58. Photo 3: Stepping back in time to June 3, 1985 when MP 58 was called WESTON. The train was Ringling Brothers Red Unit 43 cars Circus Train heading to Philadelphia. JACKSONVILLE, Fla. - January 15, 2014 - CSX Corporation (NYSE: CSX) today announced fourth-quarter 2013 net earnings of $426 million, or $0.42 per share, down slightly from $449 million, or $0.44 per share in 2012. Prior year results included after-tax real estate gains of $57 million or 6 cents per share. "Supported by the strength of an expanding economy, we delivered 6 percent volume growth in the quarter, despite another sharp decline in coal," said Michael J. Ward, chairman, president and chief executive officer. "As the economy continues to expand, CSX is well positioned to leverage that environment to create sustainable long-term value for our customers and shareholders." challenging winter weather at the end of the quarter. However, the cycling of prior year real estate gains contributed to operating income that was essentially unchanged at $813 million. For the full-year 2013, net earnings were $1.83 per share, up slightly from $1.79 per share in 2012. Full-year 2013 revenue increased 2 percent to a record $12.0 billion, operating income remained stable at $3.5 billion, and the operating ratio increased slightly to 71.1 percent compared with 70.6 percent for 2012. Looking forward, the company remains on target to sustain a high-60s operating ratio by 2015 and achieve a mid-60s operating ratio longer-term. CSX executives will conduct a quarterly earnings conference call with the investment community on January 16, 2014, at 8:30 a.m. Eastern time. Investors, media and the public may listen to the conference call by dialing 1-888-EARN-CSX (888-327-6279) and asking for the CSX earnings call. Callers outside the U.S., dial 1-773-756-0199. Participants should dial in 10 minutes prior to the call. In conjunction with the call, a live webcast will be accessible and presentation materials will be posted on the company's website at http://investors.csx.com. Following the earnings call, an internet replay of the presentation will be archived on the company website. and statements regarding future economic, industry or market conditions or performance. Forward-looking statements are typically identified by words or phrases such as "will," "should," "believe," "expect," "anticipate," "project," "estimate," "preliminary" and similar expressions. domestic or international economic, political or business conditions, including those affecting the transportation industry (such as the impact of industry competition, conditions, performance and consolidation); (iii) legislative or regulatory changes; (iv) the inherent business risks associated with safety and security; (v) the outcome of claims and litigation involving or affecting the company; (vi) natural events such as severe weather conditions or pandemic health crises; and (vii) the inherent uncertainty associated with projecting economic and business conditions. What a Water-Level way to end the Year!! Spent the last two days following the NS 1066 around the area with my good friend, Jim Rowland. 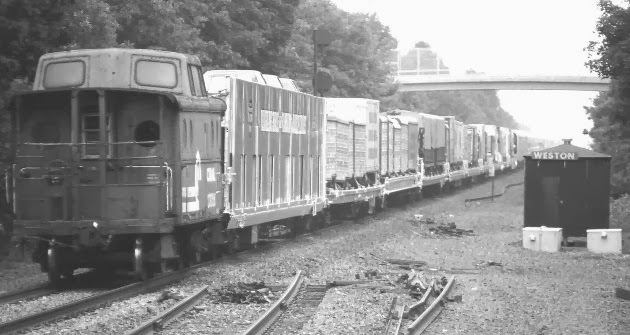 This is the Norfolk Southern's New York Central Heritage Unit. It arrived in the area on 16-N on Friday and today operated on the Portland PA local. Tonight it is to go to Hazleton, PA on the local train to that municipality. NORFOLK, VA. - Norfolk Southern Corporation participated in the location of 67 new industries and the expansion of 25 existing industries along its rail lines in 2013. 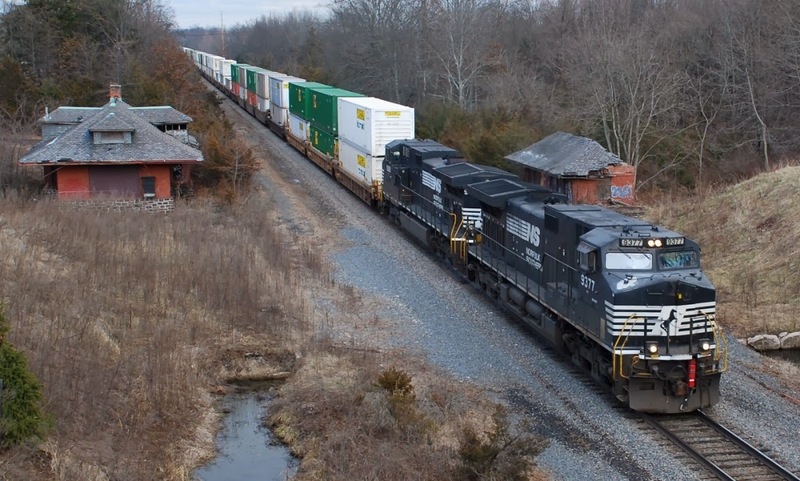 New plants and expansions representing an investment of $2.3 billion by Norfolk Southern customers are expected to create more than 3,100 new jobs in the railroad's territory, eventually generating more than 136,000 carloads of new rail traffic annually. Norfolk Southern assisted state and local government and economic development officials throughout 14 states in helping customers identify ideal locations for new and expanded facilities. "The energy sector has been a significant story for several years and 2013 was no different," said Jason Reiner, assistant vice president industrial development. "Norfolk Southern assisted in the location or expansion of 11 energy-related facilities across our service area. Crude oil transportation and support for natural gas exploration and production accounted for the lion's share of energy projects, providing 65% of the new rail traffic reported. The energy sector will continue to provide significant growth opportunities in 2014." 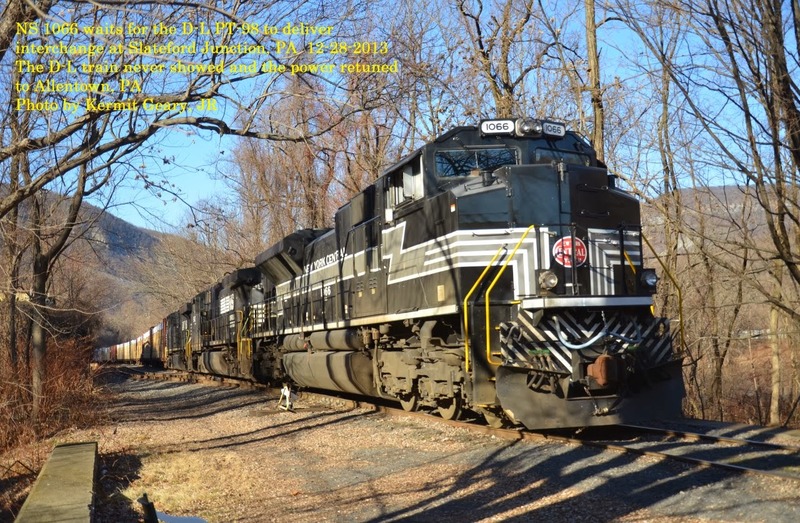 The balance of other projects secured during 2013 was distributed among several of the broad product areas Norfolk Southern serves with notable representation in metals, agriculture and automotive sectors. Norfolk Southern works with state and local economic development authorities on projects involving site location and development of infrastructure to connect customers to its rail system and provides free and confidential plant location services, including industrial park planning, site layout, track design, and supply chain management. During the past 10 years, Norfolk Southern's Industrial Development Department has participated in the location or expansion of 1,024 facilities, representing an investment of $29 billion and creating more than 44,000 customer jobs in the territory served by the railroad. Season's Greeting from Ararat, Pennsylvania!